I promise I’ll do a not-busy book related post this week, too, for those of you who couldn’t care less about busy books & how to make them. I also have an update to make to the first page, since something broke & I had to do a little redesign. I’ll get that up as soon as I get to it. Which could very possibly not be until after Christmas at this rate. Page #5 is the shoe. 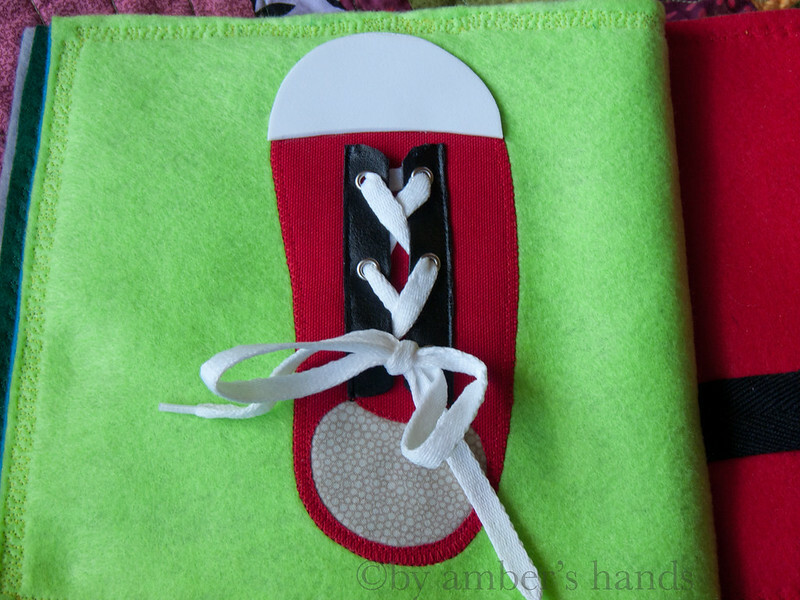 I made the red area of the shoe out of red canvas. I had originally thought I’d make several pieces of the red, to be like an actual shoe with a separate tongue and sides coming over it. Then I thought, Don’t be an idiot. You really don’t need to make extra work for yourself. You’re already making a 10 page book that’s taken you months. And I snapped out of it and made it all one piece, with a hole in the bottom cut out. The black pieces I bought by-the-yard from a ribbon-like spool. 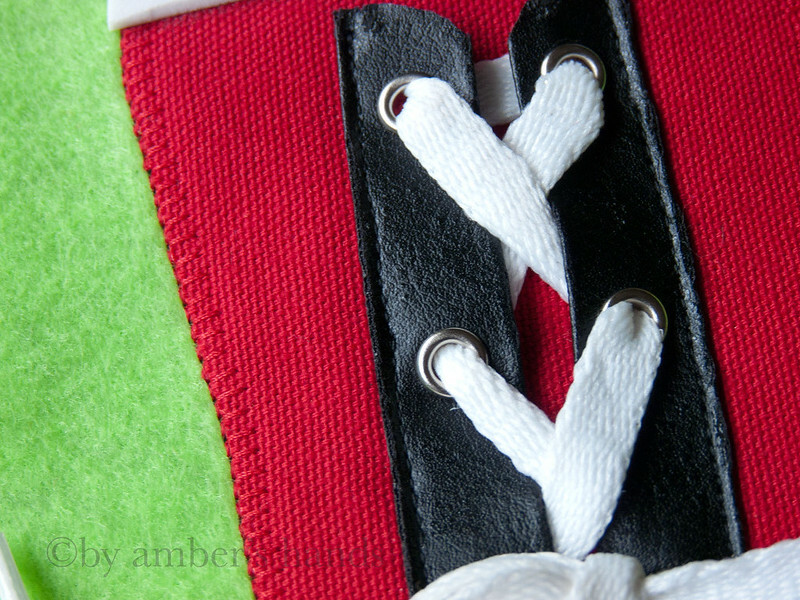 You can make your own with leather or vinyl strips & eyelets, but why? Unless of course you can’t come by the pre-made kind in your area. I sewed two strips parallel to each other with a very small seam allowance so they’d be easy to thread with the shoelace. I believe that I sewed the black pieces on before ironing & sewing the rest on the background, but I forgot to use a press-cloth at first and damaged it in a couple of spots. I’d still recommend sewing them on first if only because the canvas is already pretty heavy, and having to sew through so many layers could be taxing on your sewing machine. The tan-colored piece I ironed on before the red. It’s meant to be the inside of the shoe, if you couldn’t tell. 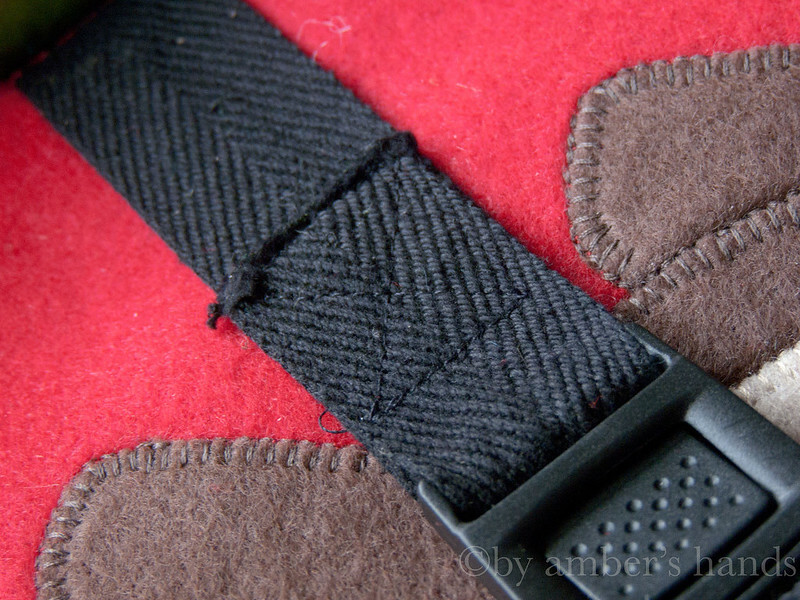 When I stitched it all together, I used a blanket stitch around the perimeter of the red portion, but a straight stitch around the inner circle because there wasn’t room for another blanket stitch. 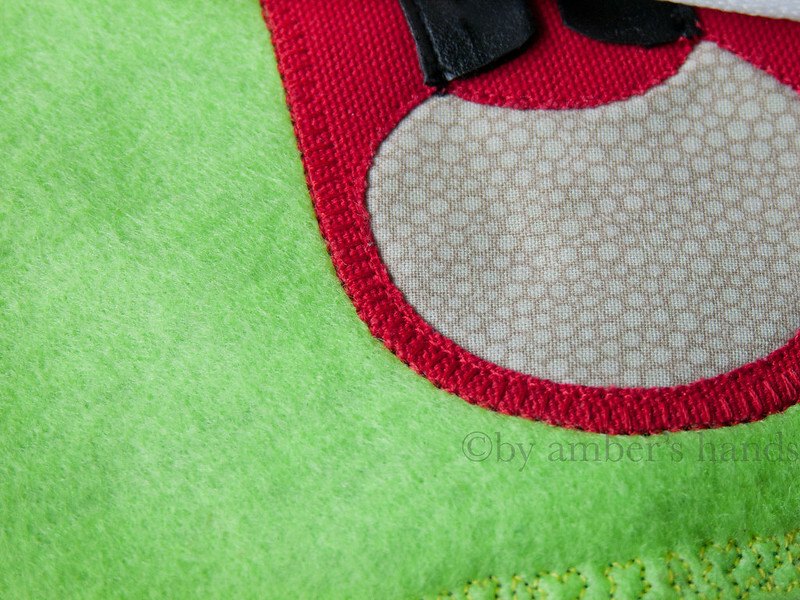 The white portion is a cut-out piece of craft foam that I glued to the top of the shoe. I think I used tacky glue, but now I can’t remember. The opposite page is the dog. This is one of Little Man’s favorites. The dog went on the page first, using Heatn’ Bond again. 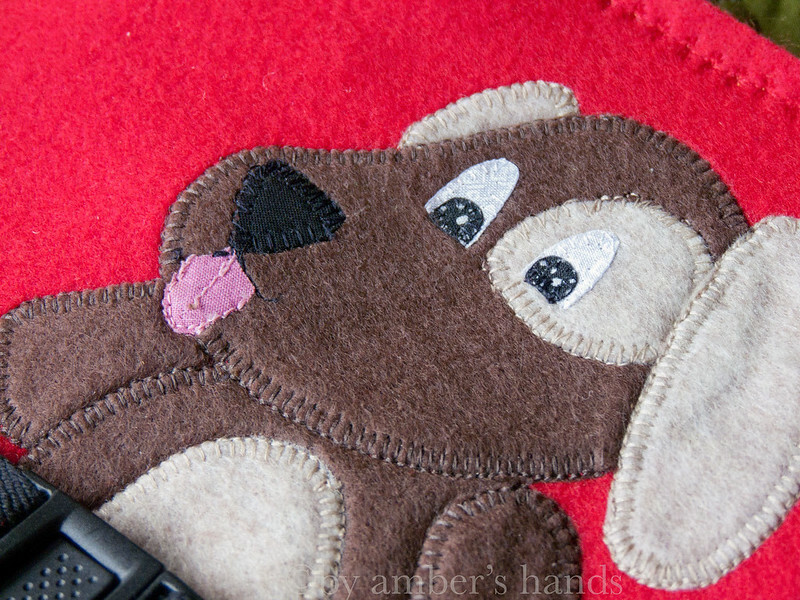 I hand-stiched the eyes on first, before putting it on the page, but then did the rest by machine. If you look close, you can tell that I was having some issues with my machine. And by “having some issues” I mean, “I didn’t put the needle in right, so it was my own fault.” Dork. I used 2 colors of felt & layered different pieces for the tummy, arms, ears, spot, etc. so it would have more dimension. I bought black straps & a black buckle to buckle him in. 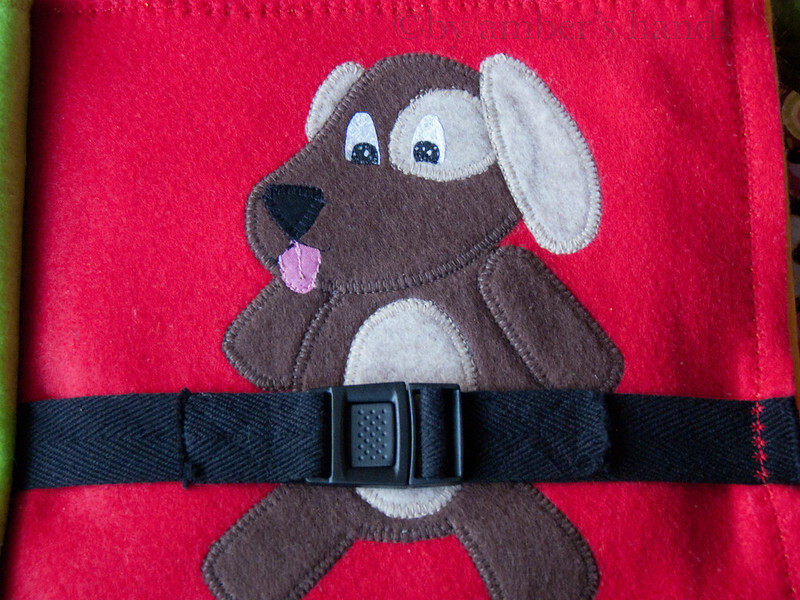 The first thing I did was to sew the strap onto the buckle. 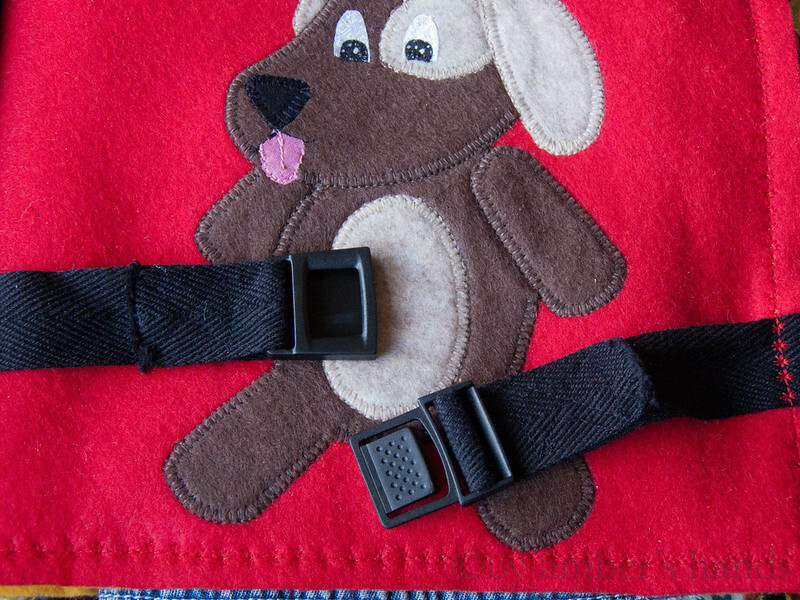 Cut the strap into two pieces, and sew one piece on either side of the buckle. To sew it on, I made a large overlap, then sewed a box shape with an X in the center, going from corner to corner, using a straight stitch. This gives it a lot of stability. Then, buckle the two sides of the buckle together, and pin the two hanging sides of the straps to the edge of the page. I did it this way and still ended up with the strap being just a little bit too tight (not sure if that’s because I let LM play with it a bunch before putting it in the book, and the felt stretched where the strap was attached?) so give yourself a little extra slack. 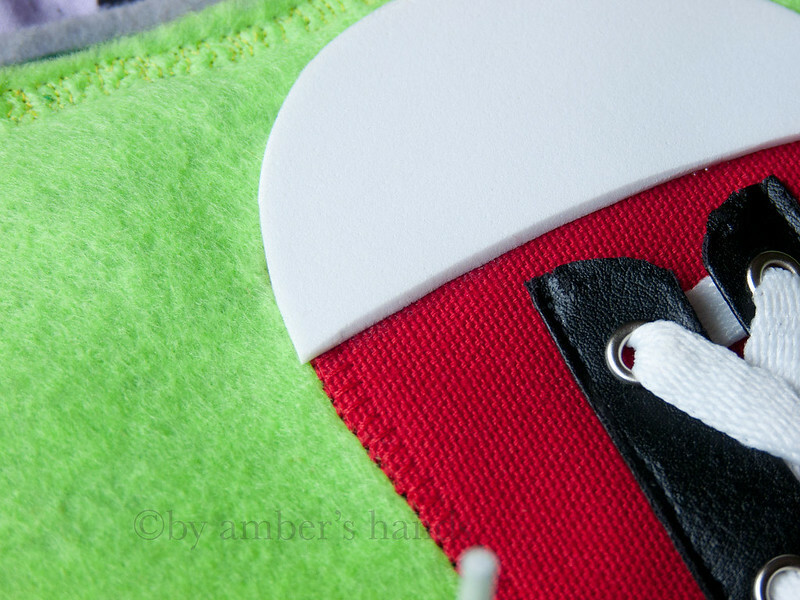 Then sew with a straight stitch to the edge of the page.